RIDGID RE 6 KIT w/SC-60C, 4P-6, PH-60C (52093) Cut, Crimp, & Punch Kit with Electrical Tool, SC-60C Cutter Head, 4P-6 Crimp Head, PH-60C Punch Head. RE 6 KIT w/SC-60C, 4P-6, PH-60. Kit includes RE 6 Tool, SC-60C Cutter Head with Copper/Aluminum Blades, 4P-6 4PIN Dieless Crimp Head, and PH-60C Swiv-L-Punch Knockout Punch Head. Cut wire, crimp lugs and punch boxes with one tool. Interchangeable heads allow tool to be customized to individual needs. Inline design for easy, one-handed operation even in tight spots. 360° head rotation increases accessibility in difficult to maneuver spaces. Bright white LED light directly illuminates workspace. Built-in sensors and LED indicators ensure reliable tool performance and monitor battery life. Industry-leading service interval maximizes uptime on the job site. Automatic ram retraction when a cutting or crimping cycle is complete. Rubber overmolded grips for superior comfort and control. Nylon straps allow easy tethering or hoisting. Multi-functional tool saves valuable cargo space and eliminates need for different tools. Supplied with two batteries, charger and carrying case. Approximate Cycle Time: 5 seconds. Service Interval: 32,000 cycles. Temperature limit: 15°F - 122°F (10°C - 50°C). Power: 18V Advanced Lithium Battery platform. SC-60C Cutter Head with Copper/Aluminum Blades. Designed for cutting up to 750 kcmil (MCM) copper/aluminum building wire and 500 kcmil (MCM) copper fine stranded wire. 4P-6 4PIN Dieless Crimp Head. Classified to UL 1976 for copper connectors and wire from #8AWG to 750 kcmil (MCM) and aluminum connectors and wire from #8AWG to 500 kcmil (MCM). PH-60C Swiv-L-Punch Knockout Punch Head. Punches up to 4 holes in 12 gauge mild steel and 14 gauge stainless steel. 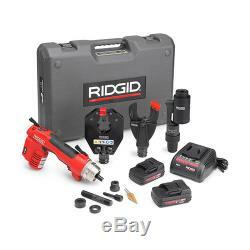 The RIDGID RE 6 KIT w/SC-60C, 4P-6, PH-60C (52093) Cut, Crimp, & Punch Kit with Electrical Tool, SC-60C Cutter Head, 4P-6 Crimp Head, PH-60C Punch Head, features the RIDGID QuickChange System, which allows users to cut wire, crimp connectors and punch boxes with just one tool. A moveable collar lets contractors quickly and easily switch between interchangeable heads, which can be rotated 360 degrees for better access in tight spaces. The RE 6 therefore eliminates the need to carry multiple, dedicated tools to the jobsite or completely switch from one tool to the next, increasing efficiency and maximizing productivity. When the RE 6 is operated, an internal electric motor powers its hydraulic pump, which supplies fluid to the cylinder of the tool, moving the ram forward and applying a 6-ton force to the specially designed tool heads. The RE 6 comes with two fabric loops that can be used with various attachments, such as shoulder straps or tie off lanyards. The RE 6 is also equipped with a bright work light that turns on when the run switch is depressed, allowing users to easily illuminate work areas. Status lights on the tool ensure tool performance, monitor battery life, and indicate when the tool requires service. 1 - RE 6 Electrical Tool. 1 - SC-60C Cutter Head with Copper/Aluminum Wire Blades. 1 - 4P-6 4PIN Dieless Crimp Head. 1 - PH-60C Swiv-L-Punch Knockout Punch Head. 2 - 18V Advanced Lithium Batteries. Virgin Islands and American Samoa. Due to international voltage requirements, please ask us prior to purchasing to confirm your product will operate correctly in your country. The item "RIDGID 52093 RE 6 Electrical Tool Kit with Cutter, Crimp and Punch Heads" is in sale since Thursday, February 21, 2019. This item is in the category "Business & Industrial\Light Equipment & Tools\Hand Tools\Other Hand Tools". The seller is "testequipmentdepot" and is located in Melrose, Massachusetts. This item can be shipped worldwide.